‘You cry like a girl’ ‘man up’. I’m sure many of us have heard these, or have had these said to us, or have probably said them ourselves at some point as kids. Gender tropes have been around since time immemorial (I’m so glad I’ve finally used that in a sentence). Until relatively recently, it was perfectly acceptable to reduce women who dared to speak up as hormonal, emotional and overtly sensitive creatures, prone to mental instability. By contrast, all men were meant to be big and strong. Boys who transgressed these norms were bullied as weak or homosexual. In an ideal world, these ignorant and bigoted opinions would by now be totally erased from the societal mindset. However, I think we can all agree, we are far from utopia. As I’ve probably repeated a thousand times, 1 in 4 people in the UK will suffer with a form of mental health problem at some stage in their lives. However, what some don’t realise, is that gender is a factor that comes into play. 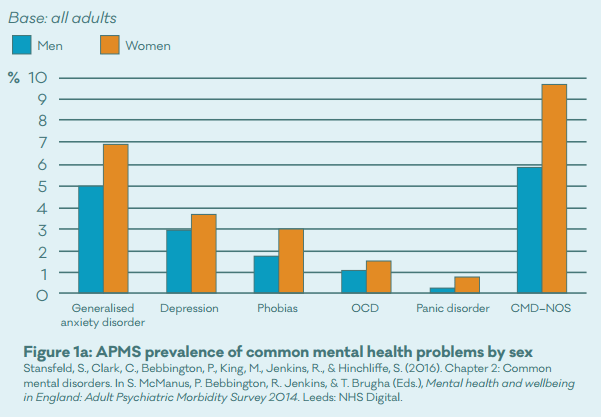 According to the Mental Health Foundation in England, women are more likely than men to have a common mental health problem (see the below diagram) and are almost twice as likely to be diagnosed with anxiety disorders. And yet, when it comes to suicide rates, men are more vulnerable. MHF uses the statistics from 2013 to highlight the disparity. Out of the 6,233 suicides in the UK, 78% were male. Samaritans data reinforces this reality: in 2015, out of the 6,188 deaths, the age bracket with the highest percentile was men aged 40-44. Cumulatively, men were three times more likely to kill themselves than women. This may be partially explained by a male reluctance, an inability, to seek help about their problems until it’s too late. Indeed, the Mental Health Network, a department of the NHS, reported that women are more likely to admit they’ve been diagnosed with a mental health problem, with 33% compared to only 19% of men. Why is it men feel they cannot open up? 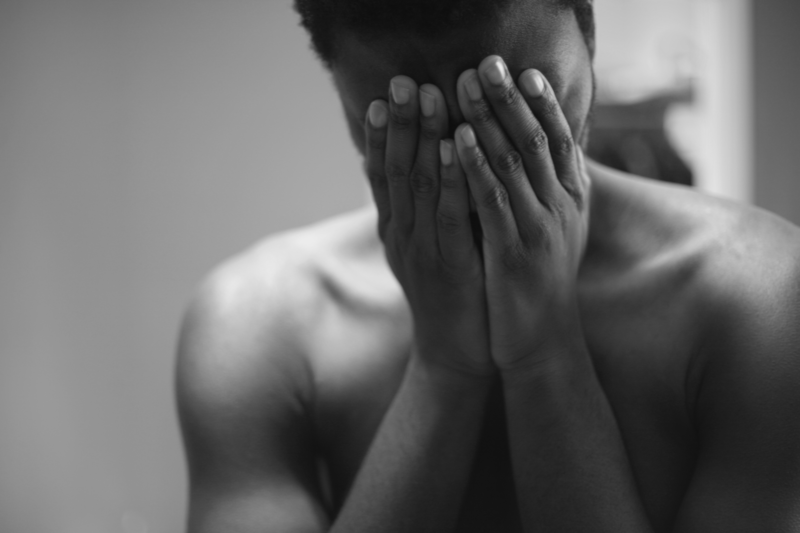 Because although our society will now support and praise women, particularly white middle-class ones – I’ll discuss the BAME community’s experience of mental health next week – who seek help or speak up, the same is not the case for men. The gender stereotypes I described above still resonate in different forms. Robert Webb is famously known for playing the pot smoking, dim witted, but lovable, Jez, best friend to the socially awkward, sexually repressed, Mark Corrigan on Peep Show. However, he is a far cry from his character. Not only did he attend Cambridge, along with his co-star, but he also suffered the tragic loss of his mother at sixteen. He now admits that gender norms regarding emotions stopped him being able to talk about and deal with his loss. He is now a key campaigner in recognising the hidden mental health crisis occurring for men in our society. In an interview with Lorraine Kelly he stated, ‘I’ve always had this interest about how boys are supposed to be boys and masculine. Boys are supposed to be good at football and swimming and maths and science and they’re supposed to be cheeky and boisterous.’ And during an interview on Channel 4 News he explained how men are only ever taught anger as an outlet for feelings, and that this has had damaging effects on their mental and emotional development. I’m not saying the male mental health experience is substantially more prejudiced than women’s. The old stereotypes for us still creep out, I cannot count the amount of times I was told my erratic moods were just caused by my time of the month and that I was just being a typical girl. However, it has to be at least appreciated that men are more limited in their ‘allowed’ emotional responses and boundaries. It’s strange, and completely wrong, that in 2018 a boy can still be allotted into a box which allows him to have the emotional range of a caricatured caveman. It’s no wonder if you’re told by society your entire life to bottle up your emotions and repress any vulnerability, that you’ll have a higher chance of struggling with your mental health later in life. But I guess, better to repress and remain depressed than dare to talk about how you feel – the good old British stiff upper lip. Men, and of course women, shouldn’t be too ashamed, or embarrassed and scared to admit that they are struggling. This gendered stigma around mental health can only cease to be when our mindset changes. We, rightly, preach about equality for women in the workplace, in the law and social standing. We must also, in conjunction with this, value and be concerned with the unspoken taboo of male mental health, and push for equality in how it is perceived. If we can, and not necessarily wrongly, accept that household pets can have depression and anxiety, surely men having emotions isn’t too hard to believe?